I suspect it’s things like this that helped them to the win.. But while there are some great designs (and squads!) in that post, there are a lot more wonderful women’s cycling teams out there, so I’ve been asking for nominations for the second voting post of the year, which focuses on the smaller teams. I’ve been sent some great examples by readers and tweeters, and now you can vote for your favourite of these, too, and as always, I’ve included links to where you can buy these kits if you want to support the teams, or just think they look great. As they are smaller teams, not all of them have had team launches yet, so there isn’t as much media… yet! The poll is at the bottom of the post, and voting is open until 10pm GMT on Thursday 18th February. If you’re still disappointed your favourite team wasn’t nominated, let me know in the comments or on twitter with a photo of the kit, and I’ll edit the kit into the post, below the poll. You won’t be able to vote for them, but they’ll be here for posterity – and if you want to see more women’s 2016 kits, check out the great Velorooms thread. My previous years’ women’s team kit votes are here, from 2014, and the 2015 ‘pro’ teams and ‘best of the rest’, on Podium Café. All photos are from the team’s websites unless otherwise stated – click through for the sources and credits. It’s a bit of a tradition for me to run through the 2016 women’s kits at the start of the season, and with more women’s racing due to be on tv or streamed this year than ever before, it’s a great chance to get our eye in. Now we’ve had the Argentinian and Aussie January racing and the Ladies Tour of Qatar, and a set of team presentations (with more team videos than ever) we’ve had the chance to see most of them in action…. so it’s time to vote for the one you like best! I’m starting with kits from the teams that are racing the 2016 Women’s World Tour – but if you want to nominate other women’s road team kits, tell me in the comments or on twitter, and I’ll put up a “best of the rest” vote – you can see some of them in this great Velorooms thread. And if you want to buy any of these kits, I’ve got links in the post too. The previous kit posts are on Podium Café – for 2014 and 2015. UPDATE! The poll is now closed – check out the results at the bottom of the thread. But you can still vote for the smaller teams in the “Best of the Rest” poll. 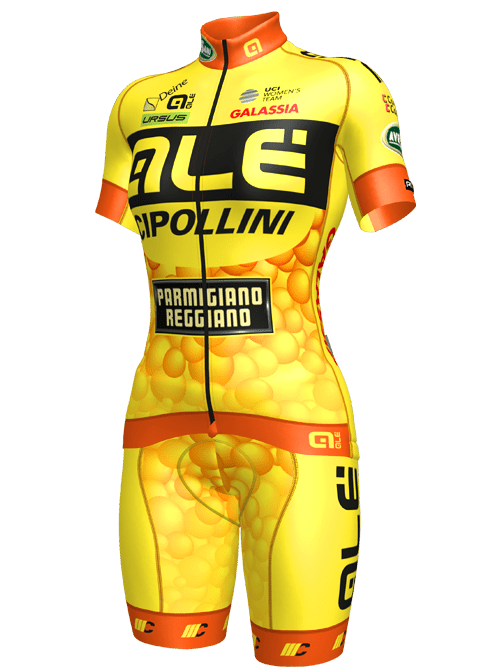 It looks like, from the team presentation photos, and of course when Malgorzata Jasinska won the GP San Luis, and Marta Tagliaferro won Stage 2 of the Tour Femenino San Luis, that the kit is the same #YellowFluorange kit as last year, with added sponsor names, making them the easiest team to spot on a bike. And as someone who likes either cool minimalism, or “WOW, I need sunglasses!”, that makes me very happy! If you like it too, you can buy versions of the jersey and jackets without all the team branding on the Alé website – it’s the “bubbles” design, for example, the women’s 2014 short sleeve and current winter jersey and jacket, and men’s winter jersey and jacket. Podcast Episode 18 – Rock the Vote! Alright, this week’s exciting because we’ve kicked off the voting for the Social Media Jersey, but don’t worry, there’s still time for you to donate! Among other highlights of the show, I don’t edit out my rant about haircuts, Sarah explains how a Frenchman discovers women can ride bikes and I give really bad job and relationship advice. We also talk about l’Ardeche and Brain Wash before previewing the worlds TTT and ITT favourites. Click here to stream (or right-click, save-as to download). Go here for iTunes podcast subscribing eternal joy style happiness (believed to be fully compatible with iPhone 5). Stef Wyman‘s post on Cyclismas, The role of fans in women’s cycling (This is the one that describes Sarah as “British Super Dooper Über Massive Huge Slightly Barmey Snarky Passionate Sweary Wicked Awesome fan”!) – and check out how Stef’s team, Matrix-Prendas, do social media, it’s a great website. UPDATE! Stef’s since written a post on his vision of #fanbackedwomensteam – click through and read it! UPDATE! We didn’t talk about this, but check out former pro Christophe Edaleine, who was Marijn’s DS for the week, blogging from his point of view of l’Ardèche – the same story as in Marijn’s blog, but from the other side!